Why am I writing The Explanation book series? The Explanation is the distilling of a lifetime of thinking, experience, guidance and help. The Explanation – How would you bring peace and prosperity to Earth? Why I’m writing this book series. I was born with a British passport, Dad had fur stores in London and Johannesburg, South Africa, where I learned smatterings of Hebrew, on to Madrid, Spain for a short stint in continental Europe before Vancouver, Canada where the 2nd language of the country, French, was required learning and which I found enjoyable. Then came Tel Aviv, Israel in my late teens which awakened me to the world at large and specifically conflict in that part of the world as well as during the Vietnam war. It deepened my knowledge of Hebrew… it was a time of study of science and math. Then, on to Antwerp, Belgium for an apprenticeship in the diamond industry, only to be whisked away to the UK because of a desire to study the more meaningful things in life: what is life itself? What is it all about? Why are we here? I’d heard a radio broadcast that had awoken in me the curiosity to deepen my comprehension of these questions. This lead to four years of schooling followed by a Christian Ministry that took me to Montreal and Sherbrooke, Canada (because of my French) and then on to Paris, France in 1978. I still reside in the suburbs of Paris in 2014 but have departed from the Ministry since 1994. But you don’t spend 25 years of your life devoted to spiritual matters that you believe in deeply to just ‘let them be’, at least I couldn’t. That science, theology, Hebrew and curiosity were there, gelling and welling up in me and began to express themselves with an idea: why not write a book? The book has turned into a ‘series’ with enough material, at this point, for 5 volumes. The way it came together, the process of publication, which I’m still going through, and particularly the people that I’ve met and who have helped me along the way, are all stories in themselves… but for another time. As I write this blog post, I’m starting a program Ground Zero to Hangout Hero with Lisa Engles to go alongside Wheatmark, the self-publishing company I chose for my works. It’s not much use writing if you can’t diffuse it. I need a team of experts to help me do that and I think this is the right track. To add a little bit of spice to that I was reading Lisa’s ‘about page’ and ran across a book she reads, ‘Working with the Law’ by Raymond Holliwell. It’s amazing how pieces of the puzzle fit together. His preface is remarkable, one of the most profound yet simple to understand pieces of writing I’ve seen in a long time. In a very down to earth way, he brings together massive concepts like: Mind, Truth, God, Law, Clarity… I really encourage you to read this. It’s all about using your MIND to develop CLARITY of THINKING. Thinking that has deeper meaning, that reaches out for the larger things in life, the big picture. Then I noticed that Holliwell starts 10 of his 12 chapters in his book with introductory quotes from the Bible. Both Old and New Testaments. What’s the relationship? Well, I’d just been reflecting on The Explanation series and trying to summarize it and reduce it to its most basic elements and here’s what I came up with. Holliwell advocates our thinking minds should develop a broader worldview. As the basis for his Godly approach he included mainly quotes Bible verses, theology, as the basis of ‘laws’ or his approach to success in life. He does not go into the biblical Hebrew. 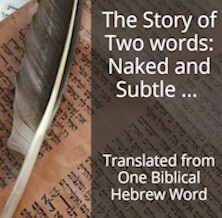 The Explanation does go into biblical Hebrew. I specifically took a two year course in order to deepen my comprehension of Hebrew and also to verify if my methodology of using Biblical Hebrew is correct or not. The methodology is valid… and the result is The Explanation. In my opinion a worldview should include an investigation and clarification of origins. The Explanation does just that, going back to the original language, biblical Hebrew, of a book about God and Laws… as Holliwell would put it. These first posts are helping readers of this blog develop a worldview. The categories (in the right column) give major portions of our physical world, piece by piece. I’ll be getting into social pieces specifically related to Mankind: how man works, his thinking and behavioral processes, his institutions, how he organizes himself and his accomplishments. Each aspect adds a piece to the puzzle, when it comes together it’s up to each reader to see whether this helps his/her worldview come into a clearer focus or not. Then we’ll look into the biblical Hebrew to see what the Old Testament worldview is and whether it ties in with the New Testament worldview. As Holliwell says, this is a journey, not an afternoon stroll. Yes, it’ll take time and patience, but, as I generally say, for big questions, (and ‘life’ is a big question) we want big answers… which, by nature, won’t come overnight. Hang in there, stay with me as we forge into the jungle of information available to us to come up with those nuggets that can help us be directed to a wellspring of veracity. Since you read all the way to here… you liked it. Please use the Social Network links just below to share this excerpt of Inventory of the Universe, Why am I writing The Explanation book series?